I don’t know about your family but mine were split down the middle on the love/hate turkey debate. Mostly the kids didn’t like it, found it dry and tasteless. Until I learned how to brine a turkey! Game changer, and really not hard at all. You really can play with the flavours that you like best and that fit the menu and season you are cooking for. Since James loves Turkey, and he didn’t get one for his birthday, I decided to make one for Easter this year. The only issue? I know how to brine a turkey for the holidays, with all those earthy Christmas flavours, but what about for Spring? I wanted something brighter, lighter and fresh. The brine recipe that results is definitely unusual, but it’s really beautiful and fragrant and wonderful. Serve it up with a white wine herb gravy and all the fixings for a feast that is truly Love on a Plate. These oven bags are perfect for making brining your turkey much easier. Simply place turkey inside double bagged oven bags, place bag inside large roasting pan. Carefully pour brine into bag, squeeze out as much air as possible and tightly tie a knot. 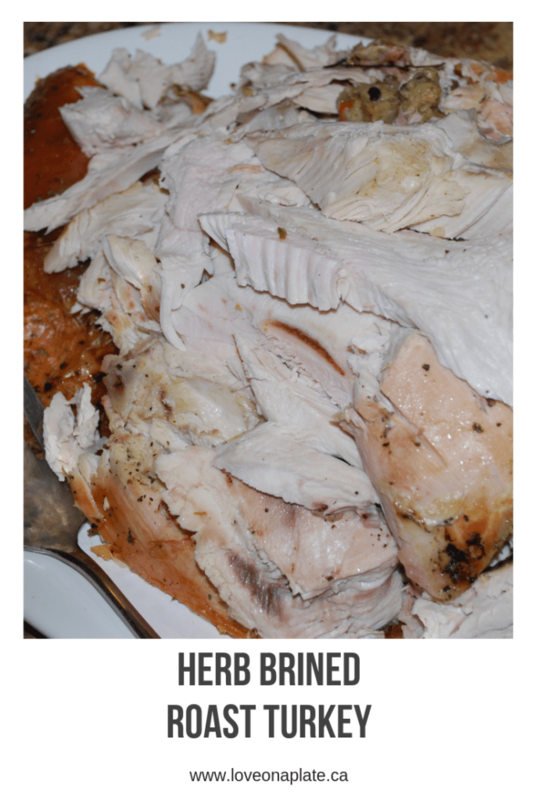 Let turkey brine for 24 hours in the refrigerator. To cook, remove turkey from brine, rinse and pat dry with paper towels. To avoid a big mess and a lot of sanitizing, place a layer of newsprint on the entire counter top. When your done, it’s easy to toss! Proceed with roasting your turkey according to your favourite recipe or try one of these methods to produce a true feast.